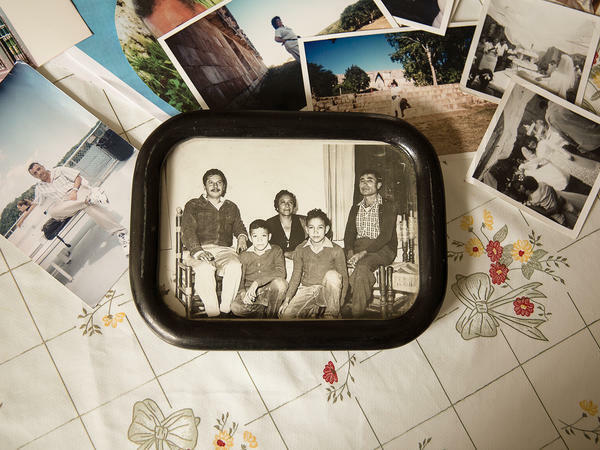 Albino Quiroz Sandoval is seen at age 10 (bottom right) with relatives including his parents and brother. Now in his 70s, he has been missing for more than a year. A sign at the front of Quiroz's home reads: "June 16, 2018, 15 months since the aggravated kidnapping of Professor Albino Quiroz Sandoval. The human rights of the victim and the family have been violated. There is no prompt and expeditious justice." Quiroz likely went missing from near his home in Tepoztlán, a tourist destination not far from Mexico City — with relatively little crime. An empty chair and an unworn shirt sit in the Quiroz home in June. More than 15 months after Albino Quiroz went missing, the family still has no idea what happened to him. Quiroz's family scoured the streets of Tepoztlán, questioning neighbors and seeking witnesses in the 71-year-old's disappearance. 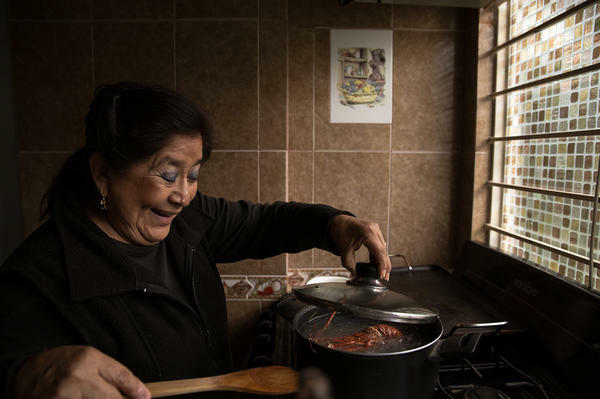 At home, Albino Quiroz's presence can still be felt in the kitchen, the favorite room of his wife, Maricela Peñaloza Flores — and a gift from her husband. It is a reasonable assumption. More than 37,000 people have disappeared in the country since 2007, according to a Mexican government database. Independent monitors say the number is even higher. The family quickly found Albino's car just a few blocks from his house but saw no sign of him. Juan Carlos kept digging. He questioned neighbors and reported the disappearance to police. But searching for people who've disappeared isn't easy in Mexico. "People are afraid to speak out because they don't know the consequences, who might be behind a certain action or if they might become implicated," says Juan Carlos. He pushed on and soon learned his father had been lending money to a local lawyer. More stories emerged about the lawyer: He was allegedly a con man, targeting retirees with sob stories of mounting medical bills for a sick daughter. The retired schoolteacher, who had lost a son in a tragic house fire years earlier, would have been a perfect target. Juan Carlos later found an eyewitness who said he saw Albino in the lawyer's office and watched the lawyer hit him, knocking him to the ground the night he went missing. No one knows what happened after that. His disappearance, like that of thousands of Mexicans across the country, has left a trail of emotional trauma. "It's like this house has been left without its soul," says Albino's wife, Maricela Peñaloza Flores, as Juan Carlos gently strokes her arm. "I don't know what happened to my husband. I don't know where he is, if he's alive, if he's scared, if he's hungry, if he's cold." Each night for decades, Maricela and Albino settled into the shared peace of being close together. Now that peace has vanished. "I can't sleep in the bed anymore," Maricela says. "I sleep on top of the covers. I used to get in and feel his warmth. Now, I try to hold a pillow, or two or three, but they don't do anything." More than 15 months after Albino went missing, the Quiroz family still has no idea what happened to him. An investigation is ongoing, but no one has been tried for his disappearance. The pain and anger of the Quiroz family is duplicated across Mexico. On top of disappearances, 2017 was Mexico's most violent year since data collection began in the 1990s, with more than 29,000 homicides. Through May 2018, homicides are up by another 21 percent compared with last year, according to the federal government. More than a decade after launching a military-led drug war, and with at least 130,000 soldiers and marines deployed annually in the fight each year, Mexican security is in crisis. 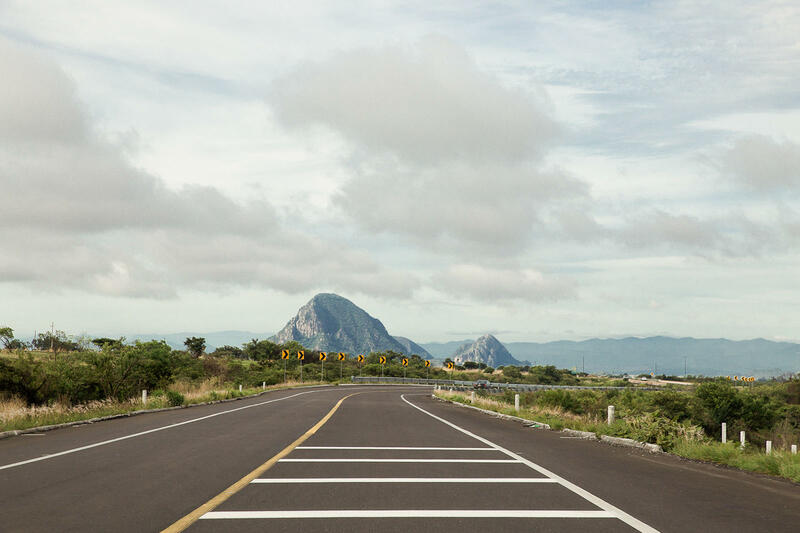 While more than 110 of the country's top drug kingpins have been captured or killed under the administration of President Enrique Peña Nieto, drug cartels have splintered, leading to bloody fights over territory to produce and traffic narcotics. They co-opt local governments and security forces and extort anyone they can. With presidential, congressional and local elections set for July 1, violence has been a top issue this cycle, heightened by the fact that there have been at least 120 political killings in the electoral process, according to the Mexican political consultancy Etellekt. Presidential front-runner Andrés Manuel López Obrador, running for a third time, has loudly called for changing course. "You cannot fight violence with violence. We must attack the problem at its roots," he told a massive crowd during a recent campaign stop in Mexico City. "The most humane and efficient way to deal with violence is by combating poverty." Carrying double-digit leads in almost every poll, López Obrador's vision is likely to govern Mexico for the next six years. "We see a contradiction: As police and military have grown, so has insecurity," says Alfonso Durazo, the top public security adviser to López Obrador. "Our plan is to train and professionalize police forces around the country so that we can gradually pull soldiers and marines off the streets." But López Obrador's most controversial proposal has been amnesty as a path to ending the drug war. He suggests that farmers growing poppy, young people who are used by traffickers as lookouts and drug mules could be candidates for amnesty. His opponents say it will let kingpins off the hook, but Durazo says that is not true. "What we're proposing is a process of national reflection, in which Mexican and international groups will participate ... and the consensus from that will be brought to victims, who will have the final word," he says. "We have to be the force moving it forward"
But there is no easy answer behind crimes like that one that made Albino Quiroz vanish. He was most likely not disappeared by a powerful network of organized crime, but rather by a common criminal, enabled by a country with extraordinary levels of impunity and a weak criminal justice system. According to the Global Impunity Index, 93 percent of crimes in Mexico go unreported. Of those that are reported, fewer than 4 percent result in judicial action. It also says the criminal justice systems in 26 of Mexico's 31 states and Mexico City are on the verge of collapse because of a lack of police and judges. And so it is often left to family members like Juan Carlos Quiroz to lead the investigation into loved ones' disappearances. In his father's case, he found witnesses. He presented documents linking his father to the lawyer. He tried to get morgues in neighboring states to let him do DNA tests on unidentified bodies. 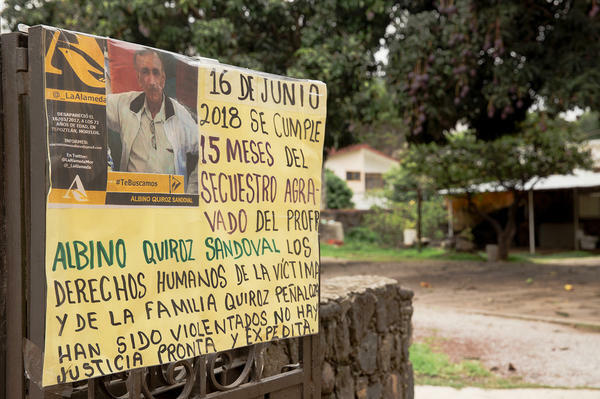 His efforts paid off: The lawyer whom the family suspected of conning Albino Quiroz was arrested for the "false imprisonment" of Quiroz two weeks after he disappeared. But there has yet to be a hearing on the case. The lawyer maintains he is innocent and is challenging his detention. "We have trusted the system over these past 15 months," says Juan Carlos. "We have done everything the right way. We have tried to strengthen the investigation. And still, we have to be the force moving it forward because at every turn, we get responses that are so discouraging." He feels let down by police and prosecutors and judges. And he doesn't see presidential front-runner López Obrador as the answer. "This has been a very disappointing election because despite the violence, despite all the tragedies in Mexico, my feeling is that no one has presented a serious alternative," Juan Carlos says. "My feeling is that everything will just continue as it has been for the last 20 years." His mother, however, believes in López Obrador and plans to vote for him. While Juan Carlos may not have faith in politics, he hasn't lost his drive to fight. "If this case can become just a small example that the system can work and we can put pressure on different parts of the system, we can slowly improve the system so that it works for everybody," he says. His mother, Maricela, isn't so hopeful. "My son still believes in the law," she says. "I don't." I'm Lulu Garcia-Navarro in Mexico City, where an election is about to take place in a week. Lulu, I spend so much time thinking about what's driving voters here in America. Tell me what is driving voters down in Mexico. GARCIA-NAVARRO: Yeah. It's not President Trump's immigration policies. It's not even the economy. It's actually violence, Sue. More than 29,000 people were killed in this country last year. GARCIA-NAVARRO: I know. That's been a record. And this year, it's on track to be even more. And people are just tired. They're scared. More than a hundred candidates and election workers have been assassinated in this election cycle alone. And, you know, everyone I've spoken to said it's out of control. DAVIS: What are the forces driving that level of violence in the country? GARCIA-NAVARRO: Well, as you can imagine, it's the drug war. But the thing that's really been interesting is that even people who are not connected to the drug trade have been touched by violence. You know, 96 percent of reported crimes in Mexico go unpunished. There's complete impunity, and it's shaping this election. So I'm going to tell you a story that really illustrates this problem. It's a story about a retired schoolteacher who is missing and presumed murdered. 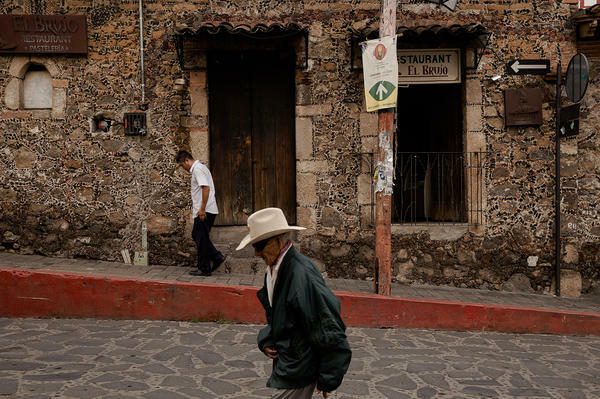 His name is Albino Quiroz Sandoval, and his disappearance took place in the quaint, cobblestone village of Tepoztlan about two hours from Mexico City. GARCIA-NAVARRO: We arrive at a modest, whitewashed home with mango trees in the yard. UNIDENTIFIED PERSON: Hola, Juan Carlos. (Speaking Spanish). GARCIA-NAVARRO: Juan Carlos Quiroz is the missing schoolteacher's son. He takes us inside, where we meet his family. And over breakfast, he tells us that his father was out running an errand and never came home. JUAN CARLOS QUIROZ: He disappeared last year in March 16, 2017. GARCIA-NAVARRO: Quiroz says as the hours ticked by, his first thought was that his father had been kidnapped. Why was your initial impression that it could be a kidnapping? I mean, for people who don't live in Mexico, why did - why would your thoughts go there? QUIROZ: People may think that kidnapping targets the rich. But it actually targets everyone. You could be a professional or a retiree and still suffer these things. So that was just my instinct. GARCIA-NAVARRO: His fear is actually based in fact. The Mexican government says that since 2007, at least 37,000 people have disappeared here. So the family went out into the town to look for the missing dad and found his parked car but no sign of him. They filed a police report and asked the neighbors for help. But people in Mexico these days are afraid. QUIROZ: People are not trusting everybody. It's very strange. But there is distrust in this community. It indicates that the community is broken, and people don't feel compelled to share what they know. They don't know if they are going to get into trouble. QUIROZ: They don't know the consequence. GARCIA-NAVARRO: ...They might become implicated. QUIROZ: Yes. Or they don't know who did it and if whoever did it has any power to harm more people or come after them. GARCIA-NAVARRO: The Quiroz family was relentless, though, in trying to gather information. Just to be clear, you had to do the investigation here. And you sort of had to put the pieces together. GARCIA-NAVARRO: Quiroz says the evidence he found points to a local lawyer, an ex-cop who had been targeting many older people in the community with a sob story about an injured child in the hospital. Quiroz says his dad had given money to the man several times, apparently touched by his story, because their family had lost a child to a house fire many years ago. Quiroz believes his dad went to ask for the money back right before he disappeared. And a witness did come forward to say they'd seen his father being beaten by the lawyer. The lawyer was eventually arrested. But he hasn't even been charged, and he's appealing his detention. He claims he's innocent. Quiroz says the prosecutor in the case has been incompetent, and the family is wondering what has happened, as no body has been recovered. Quiroz says he only wants the trial to start so that everyone can have their day in court. QUIROZ: Missing for 15 months. GARCIA-NAVARRO: ...Been able to present any of the evidence against him. GARCIA-NAVARRO: What does this say to you? QUIROZ: It's a terrible situation. Over a hundred thousand murders over the last decade. We have close to 40,000 disappearances. And in the vast majority of these cases, there are no leads to bring the culprits to justice. And that's a huge crisis, and that's terrible. But we're leaving this on the other side. We are in a situation where we have a lot in our favor. We identified a subject. We have witnesses. It just takes forever because there are too many cases in the system and because the people - the police, the judges, the lawyers - they are not doing their job. So it turns into just moving papers along. And they don't look at what's at stake. And that just complicates getting justice. GARCIA-NAVARRO: This election has been called the anger vote. People here are tired of the spiraling violence and a government that seems unable to stop it. And if the polls are to be believed a 64-year-old leftist leader who's run for the presidency twice previously is set to win. Andres Manuel Lopez Obrador, nicknamed AMLO, is promising dramatic change. GARCIA-NAVARRO: At a recent rally in a dangerous neighborhood in Mexico City, AMLO said violence is out of control. GARCIA-NAVARRO: "We must change strategies," he said, "so that there will be peace. It can't just be the use of force. You can't fight fire with fire," he said, "violence with violence. The most humane and efficient way to deal with violence is by combating poverty." It's a message that resonates with voter Lucia Cardomo, who was at the AMLO rally. GARCIA-NAVARRO: She says, "We want radical change. We are tired of the same old thing." CARLOS BRAVO REGIDOR: People believe. And people also want to believe in him. GARCIA-NAVARRO: Carlos Bravo Regidor is a political analyst and an expert on AMLO. AMLO has been talking about these same issues since he first ran in 2006. And Regidor says it's a message whose time has come. REGIDOR: He has been, you know, saying over and over again that the three main problems in Mexico are corruption, violence and poverty. It's surprising in a way that, you know, in 12 years, Mexico has changed a lot. But Lopez Obrador has been, you know, talking about these issues ever since. Well, this was Lopez Obrador's time to be right. GARCIA-NAVARRO: So AMLO has diagnosed the problem, but what are his solutions? Alfonso Durazo is AMLO's top security adviser. In an exclusive interview with NPR, he told us first that the drug war up until now has been a failure. ALFONSO DURAZO: (Through interpreter) The idea's been to use the military to target cartel leaders, the big fish. They've captured 120 cartel leaders. And yet security has not improved. In fact, it's gotten worse because the cartels have fractured, and they're fighting among themselves over territory. GARCIA-NAVARRO: AMLO wants to get the foot soldiers out of the drug war, so he's proposed an offer of amnesty. Durazo said it won't be extended to the drug dealers but, rather, the hundreds of thousands of subsistence farmers who cultivate drugs and the drug mules and the kids who act as lookouts. And, in what could signal a more combative stance towards the United States, Durazo also faults America for Mexico's violence. DURAZO: (Through interpreter) The United States must control its demand for drugs and also stop the illegal trafficking of guns from the U.S. to Mexico, which is what gives firepower to organized crime. These are high-caliber weapons that exceed those used by our own armed forces. Mexico is paying the highest price in this drug war, which is the blood of its people. GARCIA-NAVARRO: Ultimately, he said, it's not only about the drug war but, rather, everyday crime and a culture of impunity in this country. DURAZO: (Through interpreter) We have to help our police forces with training and equipment, too, because the vast majority of violence in this country is not caused by organized crime. It's assaults, extortion, robbery, kidnapping, vehicle theft. GARCIA-NAVARRO: Back in Tepoztlan, Juan Carlos Quiroz's mom, Maricela (ph), points to pictures of her missing husband. GARCIA-NAVARRO: Maricela still wonders if he's alive. GARCIA-NAVARRO: "I don't know what they did with my husband," she said "where he is. I don't know if he's afraid, if he's alive, if he's hungry, if he's cold." She's left, she says, with a terrible yearning and a dread that keeps her waiting. GARCIA-NAVARRO: With tears running down her face, she says, "this house no longer has a soul. I stay here, but I prefer to be anywhere else. I can't lie underneath the sheets. I lay on top because before, he covered me. I felt the heat of his body. And now, even if I hug one or two or three pillows, there's nothing. Those are my days and nights. It's agony and despair." I ask her son, do you think you can get justice in Mexico today? QUIROZ: It's very difficult. We have trusted the system over these past 15 months. I mean, yeah. We don't have a perfect situation, but we have a lot of things that can work. If we demand that the police, that the prosecutors, that the judges do their job, I think we can change things. GARCIA-NAVARRO: He says he doesn't believe any of the candidates will bring that change. He believes that it has to come from the people pushing things forward. He says his mother, though, takes a different view and will be voting for Andres Manuel Lopez Obrador because she wants something new. GARCIA-NAVARRO: She tells me quietly, "My son trusts in the law and believes there will be justice. But the way things are going, I don't believe. I just don't." (SOUNDBITE OF DR. TOAST'S "LIGHT") Transcript provided by NPR, Copyright NPR.